Artist and craftsman Jeff Smikowski has a 30-year history of bringing peoples' dreams to life through his imagination, design skills and exceptional airbrush artistry. Jeff's dedication to his craft, his attention to complete customer satisfaction and his unwavering commitment to quality has resulted in a large T.S. Customs' client base and following throughout the country. With a diverse custom painting portfolio ranging from pedal cars to monster trucks, T.S. Customs has come to realize that "if it moves or has a motor, we've probably painted it." Jeff uses only the industry's best undercoats, base coats, candies, pearls, and topcoats, which are carefully baked in a controlled environment to factory specifications to ensure the highest quality results in both appearance and durability. Having refined and perfected this process over many years, T.S. Customs is so confident in their services and products that they are able to offer the industry's only LIMITED LIFETIME WARRANTY on all of their custom paint projects. Needless to say, not only will your paint job look great, but it will look great for a long time. Just one more reason why Jeff's customers keep coming back to T.S. Customs for their custom paint needs. Jeff's son Adam formally joined the T.S. Customs team in 2005, bringing years of experience developed while growing up around a busy custom paint shop. A quick learner, it wasn't long before Adam developed a keen intuition and eye for the art and science of crafting custom rides and he has since established himself as one of the shop's greatest assets. His spray gun mastery is surpassed only by his quick wit and desire to deliver to clients exactly what they are looking for, and his top-notch mechanical skills provide for complete in-shop motorcycle disassembly and reassembly services. When you are in the shop or see us at a show, ask Adam about the latest developments in special effects lighting; the guy is truly an artist and electronics wizard when it comes to crafting that special one-off touch for a special ride. While Jeff loves painting just about anything and welcomes the chance to take on new and unique projects, his real passion is custom motorcycle painting. Perhaps it is because he was born and raised in Wisconsin, home of Harley Davidson where the summer's air is often broken by the roar of passing big V-twin thunder. Or perhaps it's because Jeff is a motorcycle enthusiast himself and when he's not behind the paint gun or airbrush, you might find him gunning his favorite ride down the back roads of the Kettle Moraine. If you ask him which he likes better, painting motorcycles or riding them, Jeff will just laugh and tell you that he hopes that he will never have to choose one over the other. And while the custom motorcycle painting awards T.S. Customs has received over the years have become too many to list, Jeff still enjoys entering his bikes into the competitions because he says it keeps him on the cutting-edge of motorcycle painting and forces him to continue to innovate and create. He can reproduce virtually any motorcycle paint job that you can show him, but Jeff feels his real distinction in the Milwaukee custom motorcycle painting scene is his determination to bring fresh ideas and techniques to motorcycle painting that will help set his customers' bikes apart from the rest of the pack. If you are in the area stop by our shop and receive a 10% off of your first parts purchase in choosing from a full line of parts and accessories from more than 2,000 manufactures; and if we do not have it in stock we can usually get it from our in-state warehouse stocked with more than 300,000 items. 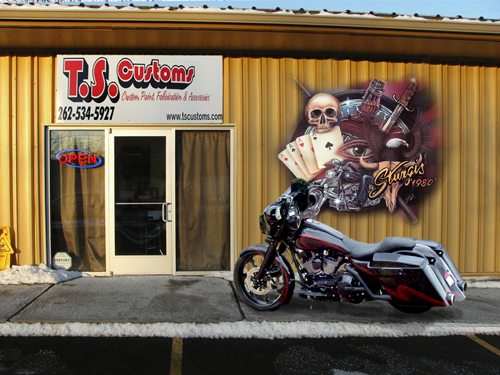 Award-winning custom bike painting and MORE! If somebody makes it—we can get it. Call us.